A balloon equipped with a projector and wireless connection to the web that enables people to submit content online and broadcast it in public spaces. The balloon is located in open urban spaces frequented by pedestrians at sunset and night (e.g. plazas, parks). The ball is tethered and floats at a height of approximately 3 stories. The images and text submitted via this site are projected directly below it. The project aims to create a parallel experience between urban and information spaces. Balloons filled with air are also filled with data: the body of air inside Urballoon becomes a metaphor of the content in the website. The globe displays the project's URL, becoming site in physical and digital contexts. Such a mobile architecture is highly extensible and reusable, enabling it to serve as a flexible platform for varying types of future urban applications. Our conventional understanding of the urban condition and the distinction between private and public space has been blurred by the evolution of technology. Generation and distribution of mass media are also models undergoing a radical transformation. 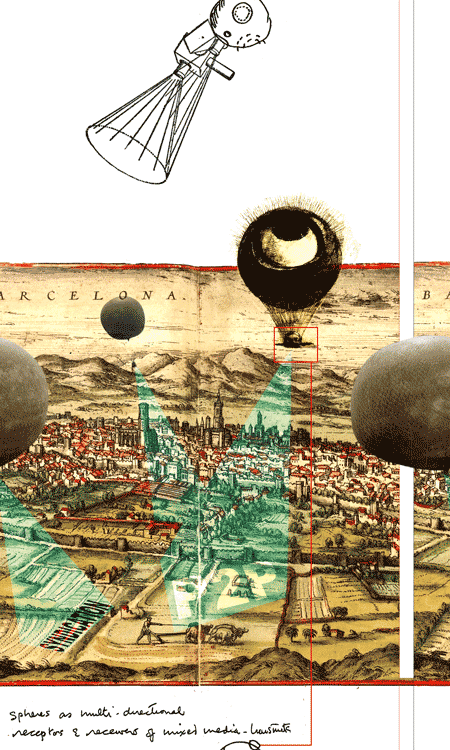 Urballoon is a probe being introduced into the flows of our current urbanity. This experimental architecture seeks to juxtapose emerging notions of mobility, P2P networking, syndication and blogging with traditional uses of social space, broadcasting and outdoor advertising. Urballoon is a work in progress by Carlos J. Gomez de Llarena which started in 2002 and was presented at Spectropolis. >from *urballon site*. Spectropolis: Mobile Media, Art and the City, an event (New York, october 1-3, 2004) that highlighted the diverse ways artists, technical innovators and activists are using communication technologies to generate urban experiences and public voice. The increasing presence of mobile communication technologies is transforming the ways we live, construct and move through our built environment. The participants of Spectropolis make obvious or play with this shift, creating new urban perceptions and social interactions with cell phones, laptops, wireless internet, PDAs and radio. Projects included a portable hearing device that transmits a soundscape responding to immediate surroundings (Sonic Interface by Akitsugu Maebayashi), an artificial flower that indicates the availability of wireless internet activity through luminescent color patterns (Hotspot Bloom by Karen Lee), a wired bicycle that chalks text messages from the web onto city streets (Bikes Against Bush by Joshua Kinberg) and a computer station for free download of digital art ephemera (WiFi Ephemera Cache by Julian Bleecker). >from *spectropolis site*.